Yesterday, Treasury Secretary Steven Mnuchin confirmed during an interview with CNBC that the issue of enforcement of a US-China trade deal, believed to be one of the most troublesome obstacles to a final agreement, had finally been resolved after both sides agreed to open 'enforcement offices' in their respective countries. This followed reports last week that Trump would give China until 2025 to make good on its promises, including massive purchases of agricultural goods, effectively punting the task of enforcement to his successor. The agreement was finally struck during a call with Liu He, the Chinese vice premier and head trade negotiator, on Tuesday. But just because the enforcement issue has been "pretty much" resolved, doesn't mean that the deal will be completed within a month, as President Trump has said. "We’ve pretty much agreed on an enforcement mechanism,” Mnuchin said during the interview. "We’ve agreed that both sides will establish enforcement offices that will deal with the ongoing matters. This is something both sides are taking very seriously." On Thursday, the Wall Street Journal published another optimistic trade update, claiming that China has 'sweetened' its offer to open up its market to US cloud computing companies following extensive lobbying by trade negotiators and - get this - Amazon CEO and Trump nemesis Jeff Bezos. US negotiators had rejected a previous proposal last week, saying it was "inadequate." Per WSJ, the new offer would involve issuing licenses for foreign businesses to operate data centers on the mainland, and lifting a 50% equity cap that requires foreign companies like Amazon to seek out domestic partners. With the enforcement issue resolved, and Beijing having passed a law intended to stop forced technology transfers and IP theft, the main issues up for debate now focus squarely on access for American tech firms like Amazon, Microsoft and Apple. These companies have invested millions of dollars in China already, but have been hamstrung by restrictive regulations. The new proposal expands on an offer made by Premier Li Kequiang had proposed during a meeting with tech executives, which was panned as "weak and unrealistic." The second proposal followed a meeting earlier this week between US tech firms and China's Ministry of Industry and Information Technology, the country's top tech regulator. American tech firms like Amazon have already formed partnerships with Chinese firms to gain entree to the mainland economy. Given the regulatory hurdles, some foreign companies have formed partnerships with local cloud companies, licensing technologies and have them run data centers in China. Amazon Web Services, for example, partners with Beijing Sinnet Technology Co. to operate the AWS China cloud-computing service in the Beijing region. Sinnet owns the hardware while AWS says it provides technology, guidance and expertise to Sinnet. Still, the new proposal didn't address the issue of data transfers. Under current Chinese law, American tech firms must store data from their Chinese operations on the mainland. But the US is insisting that this rule be changed as part of a final deal. 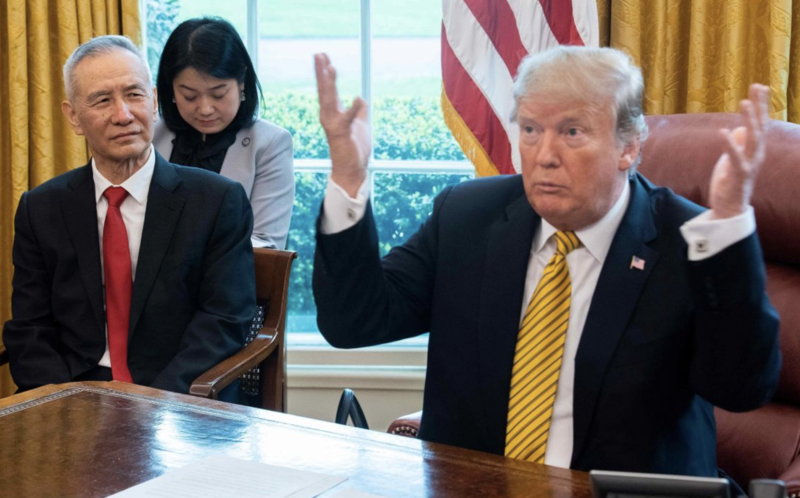 Setting aside issues of market access, the biggest obstacle to a final deal remains Washington's insistence that some of its trade war tariffs be maintained, at least in the near term, to ensure compliance with the deal. Beijing has repeatedly insisted that all tariffs be dropped. As the two sides appear to have made little progress on the issue, it's worth wondering: Will Trump cave on this to salvage his deal and secure a major PR victory as the 2020 race heats up?